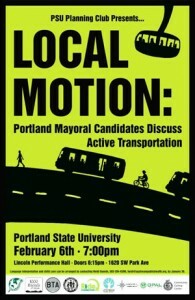 The PSU Planning Club presents Local Motion: Portland Mayoral Candidates Discuss Active Transportation on Monday, February 6, 2012 at the Lincoln Performance Hall (1620 SW Park). The [Mayoral Candidates] Forum will pose questions to the candidates regarding active transportation issues such as transit, pedestrian and cycling infrastructure, funding concerns, and major projects such as the CRC. This event is co-sponsored by a strong team of student clubs and regional non-profit organizations, including the PSU Environmental Club, 1000 Friends of Oregon, the Bicycle Transportation Alliance, Coalition for a Livable Future, the Willamette Pedestrian Coalition, the Community Cycling Center, Ride Connect, and OPAL Environmental Justice. Three mayoral candidates will be present, Eileen Brady, Charlie Hales, and Jefferson Smith. Portland Mercury’s Sarah Mirk and Larry Wallack, Dean of PSU’s College of Urban and Public Affairs, will serve as emcees. This event is free and open to the public. Doors open at 6:15pm (light refreshments will be served in the lobby), and the forum will run from 7pm to 8:30pm. A reception with the candidates will follow the forum.